For a job application to print, click here. 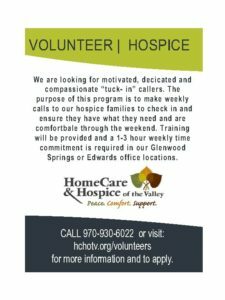 HomeCare & Hospice of the Valley is an equal employment opportunity employer committed to non-discriminatory employment practices and patient services. Benefits offered to our full-time employees are health insurance, paid time off, holiday pay, and 401k. Part-time employees are eligible for paid time off and holiday pay. Below are job openings at our agency. Please apply with Human Resources if you are interested in applying for any of these openings. Weekend RN: This position will fill Friday afternoon to evening shifts and 12-hour shifts on Saturday and Sunday. Full-time, Nonexempt. CNA: We have several open CNA positions in Vail/Eagle, Glenwood Springs/Rifle and the Roaring Fork Valley. Personal Care Worker: We need several people for this position as we are looking to grow our Private Duty services. Physical Therapist for Glenwood Springs to Parachute: Full-time and PRN positions available immediately. We need coverage in the Glenwood Springs to Parachute corridor and PRN coverage for census swings and holidays. Physical Therapist Assistant for Glenwood Springs to Parachute: Full-time and PRN positions available immediately. Central Scheduler: Full-time position available. This position will schedule all clinical staff for their field work shifts. Full-time LPN: We are looking for a full-time LPN to cover down valley patients. Admissions Nurse: This is a full-time position, primarily working noon-8:30 pm, weekdays. Responsibilities include evaluation of patient, obtaining consents and election forms, performing an initial comprehensive physical assessment and developing a plan of care. This includes completion of the OASIS.